Everyone in France is convinced that the most famous Japanese artist is Hokusai. It is a mistake that amuses Japanese a lot. In fact, the Japanese Leonardo da Vinci is not the master of The Great Wave but another who has never yet been honored in the French museums : Utagawa Hiroshige. Nonetheless, in the Impressionists’ times, Hiroshige was by far the artist who most fascinated the whole group of young rebels in the Salons. Since then and despite his unique fame in Japan and throughout the world, France seems to have ignored, forgotten or neglected him. The exhibition, which the Pinacothèque de Paris is showing today, is above all a compensation of this major forgetfulness of French museums since there has never been an exhibition of the Master of Edo. It also offers a unique opportunity to provide a perspective, since Hiroshige’s oeuvre was Van Gogh’s main reference. More than any other painter, he has been the most inspired Hiroshige’s work, to the extent that all the scenes and landscapes painted by Van Gogh from 1887 onward are direct or indirect references to Hiroshige’s art. 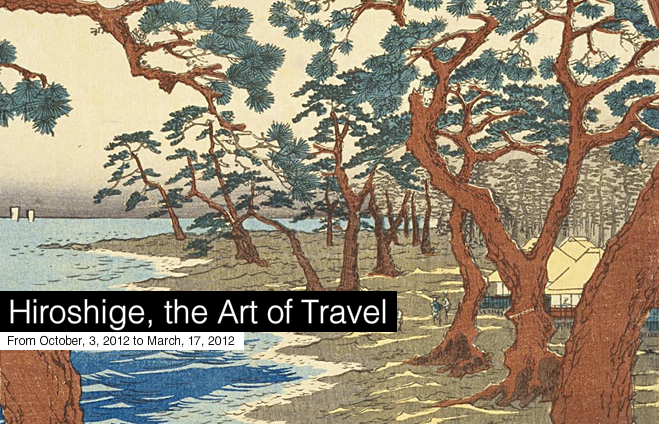 The Hiroshige exhibition is in fact shown alongside the Van Gogh exhibition, as its “second part”. This also in order to emphasize the confrontations between the two artists and above all to enter, as Van Gogh did in his time in Siegfried Bing’s gallery, inside Hiroshige’s outstanding world. That world is above all, that of travel. Beyond the nowadays-classical views of Edo, Tokyo before 1868, Hiroshige was to lead us into two mythical journeys, by taking us onto the two roads linking Edo to Kyoto. There is the southern road, aka Tōkaidō, and the northern route, aka Kisokaidō. By stopping off in each of the villages along these roads, about fifty during each trip, Hiroshige’s works lead us into that imaginary and ancestral Japan, his dream-world. But above all Hiroshige invites us to an interior journey, a journey of meditation. Hiroshige was one of the last masters in the ukiyo-e tradition. He lifted that genre, the most remarkable in the prosperous Edo period, to a hitherto unseen level. The ukiyo-e, literally “images of the floating world” refers to the highly colored style of etchings specific to the Edo period. It is aimed to display nature in its four seasons, the passage of time, as well as city life in the excessive sensations it offers to the body. This first exhibition of Hiroshige in Paris was made possible thanks to the important work carried out by the exhibition curator Matthi Forrer, an eminent specialist of Hiroshige’s art and curator in the Leiden museum, who agreed to lend us very exceptionally the group of works shown today.